It’s getting to be a bit of a cliche to say that Microsoft and Apple are pursuing radically different OS strategies. But it’s still true. While Apple seems to believe that computers and mobile devices are two distinctly separate types of gadgets, each deserving a tailor-made operating system, Microsoft thinks all those machines should run a single unified OS. So we get OS X and iOS from Apple, and Windows 8 from Microsoft. 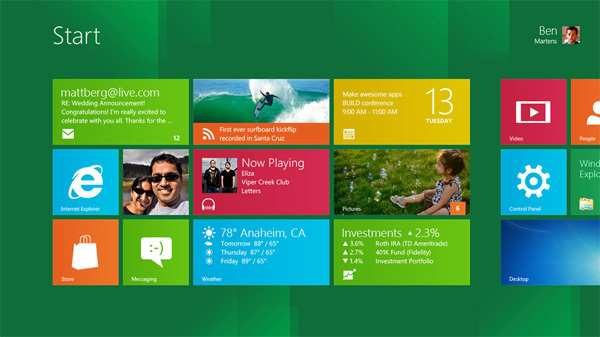 Microsoft this week is showing off Windows 8 to a handful of developers and journalists atits annual Build conference in California. While I’m not yet sold that the “Metro” user interface adapted from Windows Phone 7 is a dramatically more efficient way for everyday computing tasks (and Microsoft will allow you to switch to a standard Windows 7desktop), it does seem fairly slick for a tablet. Fans? Heat vents?? And Microsoft thought it was appropriate to show this wheezing, baking contraption to the media? I know it’s a prototype, and so hopefully the hardware will be drastically improved before launch. Because if Microsoft thinks loud fans and egg-frying heat are acceptable features on a tablet, then it won’t matter if the Metro UI is the best control innovation since power steering.